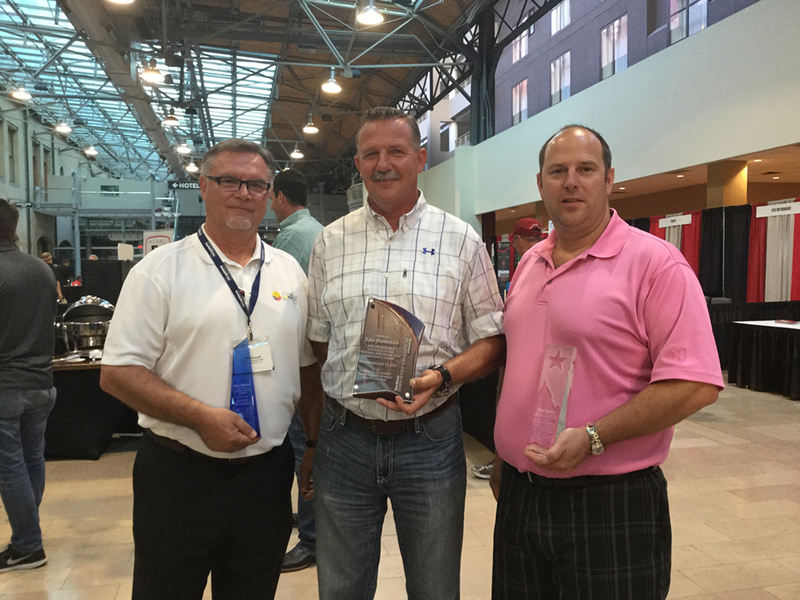 Tow Times magazine awarded national recognition to three towing and recovery industry operators for their leadership roles during the third annual Towing & Recovery Management Summit held this year in St. Louis, Mo. St. Louis, Mo., June 23, 2016	(Newswire.com) - ​Tow Times magazine, the leading publication in the towing and recovery field, singled out leading lights in the industry for Lifetime Achievement, Champion and Rising Star awards. • LIFETIME ACHIEVEMENT to GEOFF RUSSELL, president and CEO of Kauff's Transportation Systems, West Palm Beach, Florida. Over a 40-year period Russell, who started out driving a tow truck in Canada, has built Kauff's Transportation into the Southeast's largest full-service provider of towing, recovery and specialized transportation. Russell is someone whom other towing and recovery operators look up to for knowledge and wisdom, and for many years he has been a staunch advocate of raising industry standards and practices. "I'm not a person that accepts this kind of accolade very easily but it's a great honor," said Russell, who has worked with national and state towing associations to gain more respect from law enforcement, fellow first responders and the motoring public. "You take the business seriously, you take the responsibility to the motoring public very seriously. The vast majority of towing companies really want to do a good job and want to be recognized as knights in shining armor." • CHAMPION AWARD to LEE ROBERTS of Roberts Heavy-Duty Towing & Recovery, Lexington, Ky. Roberts this year was recognized by the Kentucky Office of Highway Safety as First Responder of the Year, the first time in the agency's history that a safety award goes to a towing company. Roberts, who is a 30-year veteran of the towing and recovery business, has quietly supported his local and state towing brothers. Earlier this year, one of his competitors lost his entire company in a fire and Roberts donated a truck and made space in his office to help the competitor get back on his feet. "This is almost as overwhelming as winning the First Responder Award itself," Roberts said. "I was in a position to help somebody out. You just do it. You don't even think about it. I’m tickled for my company and my guys. It means a lot to them too. It’s not just me." The Tow Times' Champion Award recognizes an individual who has made exceptional contributions championing the towing and recovery industry, is a person who fights for, defends and supports the industry’s best interests through their actions and financial support; one who contributes to the industry's growth and positive image; a person recognized outside of the industry for their extraordinary achievements. • RISING STAR AWARD to MICHAEL ASPESI of Ted's of Fayville, Southborough, Mass. Aspesi is a young leader who is extremely active in the towing and recovery sector, and who eventually is expected to be at the helm of towing industry organizations. A second generation towing company owner, Aspesi learned the towing and recovery business from his father Peter Aspesi, who also has been heavily involved in the industry for 50-plus years. "I'm humbled to get this award," said Aspesi whose company this year moved into an expanded facility. "I love the industry and I like doing stuff to make the industry better, give it a positive image." Aspesi, currently a director of the Statewide Towing Association of Massachusetts, encouraged other towing operators to join their state associations and volunteer. The Tow Times' Rising Star Award goes to a person who contributes significantly to industry organizations, exemplifies leadership and is a role model for others; strives to learn more about the towing industry and engage in professional development; and exhibits dedication to the towing industry. A unit of TT Publications Inc., Tow Times is the leading magazine in the towing and recovery industry and host of the annual Towing & Recovery Management Summit, launched in 2014. The Summit, held this year at the historic Union Station Hotel in St. Louis, provides a vehicle for towing company owners to stay abreast of industry trends, continue to professionalize their businesses and network with other leaders.